Tell the grumpy people of the world how feel with Chris Linn’s “Be Nice or Disappear” shirt! We could all use a little more niceness in the world! This is an updated version of Chris Linn’s popular “Be Nice or Disappear” design. These shirts regularly sellout at Chris’ live shows. Get yours before they “disappear”. Screen printed “Be Nice or Disappear”(tm) Design on Front. 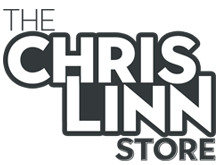 Chris Linn Show logo on back. Super soft, 100% ringspun cotton shirt by Anvil. Preshrunk. (tm) The slogan, “Be Nice or Disappear” is a registered USPTO trademark of Chris Linn / Chris Linn Entertainment.